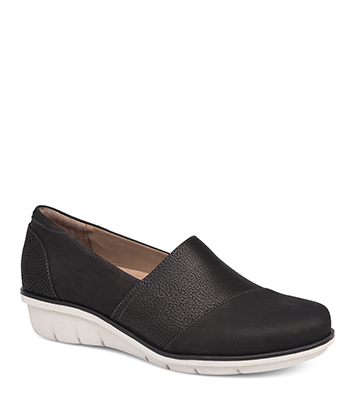 The Dansko Black Nubuck from the Julia collection. Whether worn for work or play, the versatile Julia flat is perfectly pleasing in every way. A more dressy take on athleisure styles, it features a padded collar and a shock-absorbing injected EVA/rubber outsole. The Juno carries the Seal of Acceptance from the APMA (American Podiatric Medical Association). The APMA Seal of Acceptance is awarded to shoes that promote good foot health and is independent proof that Dansko shoes are made with your comfort and long-term wellbeing in mind.